We are a small community of real log cabins featuring modern construction and conveniences. 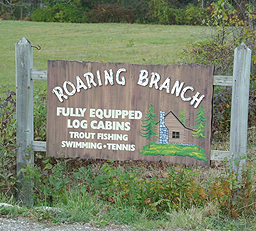 All cabins are beautifully situated among 36 acres of giant white pine trees and they all are close to the Roaring Branch, a perfect mountain trout stream. All cabins offer the smell of the pines, the sound of the stream, the casual relaxed informality of a hike in the woods or a swim in the stream and a peaceful night in front of the fireplace. 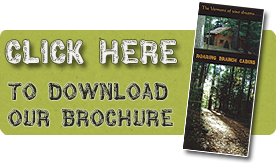 Southwestern Vermont offers countless activities in all four seasons including hiking, fishing, tennis, cycling, golfing, canoeing, skiing, antiquing, live summer theater, and unique museums. 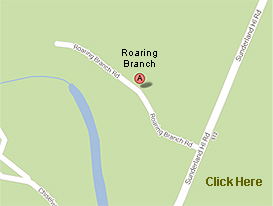 Roaring Branch is also a special place where you can thoroughly enjoy having nothing at all to do in a place of simplicity, comfort, and beauty. It is pure Vermont...at its best. Sleeps 6 people with a queen size bed in the master bedroom. Sleeps 6 with queen size bed in the master bedroom, twin beds in the upstairs bedroom, and a sofa bed. Sleeps 6 with queen size bed in the master bedroom, and triple bunk beds and one separate single bed in the enclosed loft. One and a half baths. Sleeps 6 with queen size bed in the master bedroom, extra-long twin beds in the upstairs bedroom, and queen size sofa bed in the sleeping loft. Two full baths. Sleeps 6 with two full baths. Non smokers only. No pets. Sleeps 6 with queen size bed in the master bedroom, twin beds in the upstairs bedroom and sofa bed. One and a half baths. Sleeps 6 with queen size beds in both master and upstairs bedroom. Loft has Captain's bed (twin) with trundle. Two full baths. Sleeps 6 with queen size bed in the master bedroom, twin beds in the upstairs bedroom and trundle bed in the sleeping loft. One and a half baths.